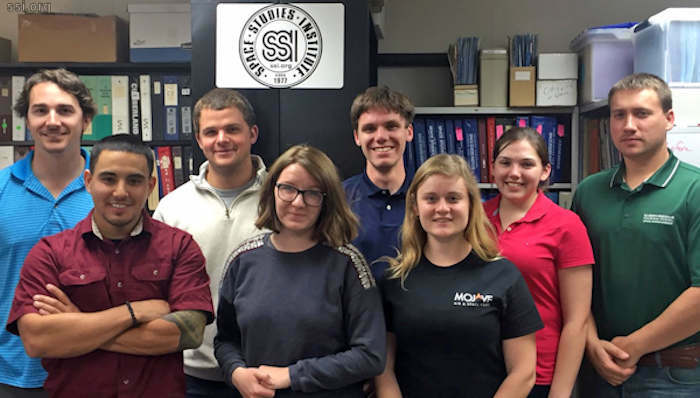 At this moment there are six amazing students from Embry-Riddle Aeronautical University Daytona Beach exploring the stacks at the SSI Library at the Mojave Spaceport. They have a long list of things to do around the area and we are very happy that they could spend some time with us. Their helping to get the thousands of classic SSI slides re-digitized is going to be a great boon for all SSI researchers but, to be honest, after spending time with them on Sunday I have to say it is even more satisfying to find that the resources of the library appear so interesting to them all on a personal level. We’ve spent time with various students from various schools over the past several months and while it is nice to hear “I’m going to be the next Elon Musk” it is even better to sit down and talk Mass-Drivers and Solar Power Satellites and – most importantly – to see that THE REASONS that Space can be a benefit to all the people of Earth are being understood and taken to heart by individuals who are now standing on the verge of becoming Leaders in the industry. Of course, a substantial part of the credit for new eyes already being open to wider potentials goes to their Professor, SSI Senior Associate Dr. Justin Karl. Dr. Karl’s CSO101 classes have The High Frontier as required reading. THAT is awesome. THAT makes a difference. And more on THAT will be coming soon as we have asked Dr. Karl to give us all some information after they get a chance to come up for air from their whirlwind working tour of the legendary Antelope Valley Space centers. Team and team leader! I look forward to the amazing re-discovered space research by this next generation! KUDOS to Dr. Justin Karl, Riddle and the bright students ahead !